iPod Solar Charger from Coldplay (!) | OhGizmo! I like my iPod and I like my Coldplay. I have Coldplay in my iPod, and that makes me smile. What doesn’t make me smile, is just how quickly the battery dries out on the $350 thing. Seems the folks at Coldplay decided to do something about that, and, in what could be the makings of a triumphant marketing ploy (or perhaps not), have slapped the logo of their latest album “X & Y”, on a Solio solar charger from company Disruptive Technology Channels. 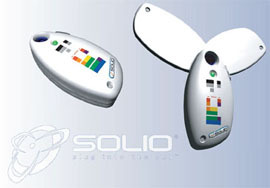 The Solio usually sells for £50. Coldplay slapped a nice little £30 markup on it, and is selling the thing here. Story VIA Techie Diva. The sweet irony is that the not really a cd x&y is copy controlled, preventing (AHAHAHAHAHAHAHAHAHAHAHA) use in your ipod.